November 29th, 2011 9:06 AM by Lehel S.
As a result, monthly mortgage payments on the median priced home—including taxes and insurance—are lower than the average rent levels in 12 metro areas, according to data compiled for The Wall Street Journal by Marcus & Millichap, a real-estate brokerage that tracked 27 metro areas. 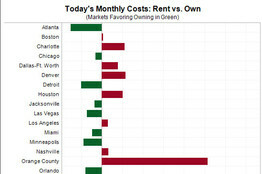 It remains less expensive to rent than to buy in 15 cities. But affordability hasn't done much to lift the sagging housing sector because many would-be buyers are unwilling to purchase a home or unable to qualify for a mortgage. "It's one of the most striking developments of the housing downturn," said Paul Dales, an economist at Capital Economics. "The initial building blocks for a recovery are in place, but the legacy of the recession is really preventing households from taking advantage." But real estate agents and economists say the trend hasn't boosted demand. That is because affordability alone hasn't been enough to overcome the obstacles in the way of a housing recovery. Some homeowners who would like to move up to larger properties are stuck because they can't sell their homes. Other would-be buyers can't qualify for mortgages because lending conditions are tight or because they don't have enough equity in their current homes to use as a down payments. "The reality of coming up with the down payment and the loan-qualification standards makes things much different than the raw numbers suggest," says Hessam Nadji, managing director of Marcus & Millichap. And even those who may qualify remain skittish about buying property in a market where prices could fall amid foreclosures and weak job growth. Ryan Young illustrates the point. He is under contract to buy a three-bedroom home in Washington Grove, Md., that will have monthly mortgage, tax, and insurance costs for around $150 less than the $1,900 he is paying to rent a slightly smaller house in Bethesda, Md. He qualified for a 30-year mortgage with a 3.95% fixed rate. Still, Mr. Young says he is cautious about owning his first home with the prospect of future price declines. "Buying a house is not a good financial decision, per se, but we needed a bigger place," said the 35-year-old scientist, "and we don't want to move every couple of years into a new rental." Mortgage rates are a big reason why affordability continues to improve. In 1991, a $1,700 mortgage payment allowed a borrower to take out a $200,000 mortgage. Today, it gets that homeowner a $350,000 loan, a 77% increase in borrowing power, says Dan Green, a loan officer with Waterstone Mortgage, in Cincinnati. At the same time, low mortgage rates aren't spurring sales because few analysts expect rates to rise anytime soon. The Federal Reserve in August said it would keep rates at ultralow levels for two years. 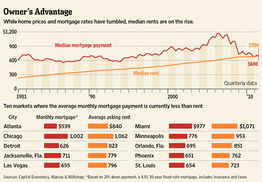 In a normal interest rate cycle, "when they go low, they don't stay for very long, and people jump in," said Mr. Dales. "This time, there is no urgency." 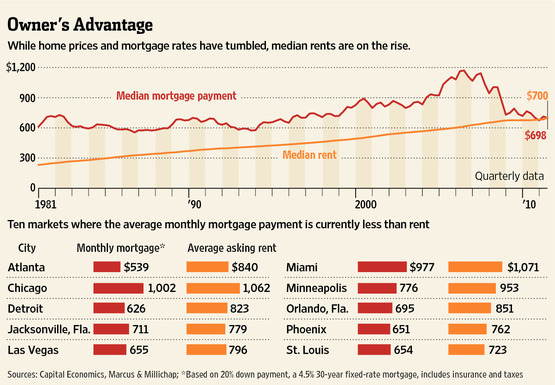 Affordability could continue to improve as prices slide even lower in coming months. Price declines are likely because the share of "distressed" sales, including bank-owned foreclosures, tend to rise in the winter, when traditional sales activity cools. Banks are often much quicker to cut prices to unload properties quickly, which means that the greater the share of "distressed" sales, the more prices tend to fall. One hopeful sign is that inventories have fallen from their bloated levels of one year ago. All 28 cities in The Wall Street Journal's latest survey saw homes listed for sale fall from one year ago, when markets were reeling with a substantial overhang of properties amid a big drop in demand. 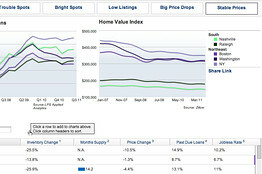 Visible inventory was down sharply in several markets, including by almost half in Miami and 40% in Phoenix.